Our fishing friend John Peterson with a typical late season perch. Not big but nice. Keep a few perch for the table and put the rest back. In some areas of the Midwest, certain fishing seasons are getting ready to close, and in some areas they’ve already closed. The closed season mostly affects walleye and northern pike anglers, and again, that’s only in some states or some areas of some states. However, there will still be lots of ice-fishing opportunities available, the action can be outstanding, and the weather is often the best of the ice-fishing season. If you would like to continue to fish through the ice, you should get after perch. Perch tactics are often almost the same as you would use for walleyes. Perch are bottom-huggers and this time of the year they will usually be in the deeper areas of the body of water being fished. Usually, but not always. Many successful perch-chasers drill a bunch of holes over a perch holding area and just start moving from hole to hole. They’ll watch their sonar to see if perch are present. If life is seen near the bottom, hang around awhile and see if you can get bit. If you don’t see anything in a few minutes, move to another hole. Buck-Shot Rattle Spoons are the most effective baits in many areas. The eighth ounce size is good to start with. If you’re seeing fish but they’re not eating, go to the sixteenth ounce size. Sometimes finicky fish will go for the smaller spoon. If the fish are biting good, go to the quarter ounce size spoon. The bigger spoon will sometimes convince the bigger fish to hit, and the heavier spoons can be fished faster also. Many anglers prefer live bait or pieces of live bait, and that’s understandable, because plain and simple, live bait works. However, for the past few seasons I’ve been tipping my baits with Impulse plastic: I like the Bloodworms in the Bloodworm Red color, but others also work well. I’ve seen quite a few instances when this plastic out-produced the real stuff just because you didn’t have to re-bait as often. If the perch are really finicky and won’t hit the spoon, try a really small bait and fish it almost motionless. A Mooska Tungsten Jig or Tungsten Fire-Ball Jig tipped with a waxworm are small, finesse presentations that will convince unwilling biters to eat. Fish them on three or four pound test P-Line Floroice for a very stealthy presentation. Daytime temperatures can get pretty warm in the late ice season. That makes for very comfortable fishing, but can also create some slushy conditions. I like to wear my Cabela’s GuideWear this time of year, especially the bibs. They have reinforced knees which will keep you drier and warmer if you spend much time kneeling by a hole. GuideWear is four-season clothing for many anglers. February and March can provide outstanding ice-fishing. Walleyes will bite good in areas where they’re still fair game, and crappies are willing biters also. 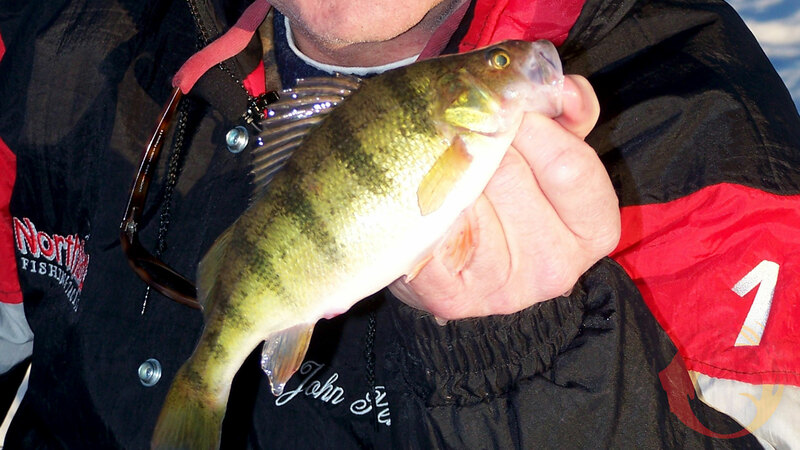 But for many ice-anglers, perch are the preferred quarry this time of year. They’re plentiful in many areas of the Midwest, they’re usually willing biters, and they’re great on the table. Find out for yourself in the next few weeks how perch can stretch your ice-fishing season.